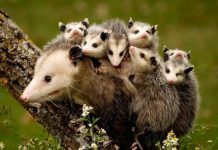 American possums (commonly known as ‘opossums’) are almost entirely solitary except for the breeding season when females are often seen with their babies. However, the Australian possums which belong to the order Didelphimorphia are mostly gregarious as they fancy living in groups. But there are many Australian possums that aren’t social at all. In this article however we’ll discuss as to how do possums live in groups? Since American opossums live alone so we’ll only be studying the behavior of Australian possums in groups. Lemuroid ringtail possum likely lives in small family groups. The maximum size of a group is three that can consist of one male; one female and a young. However, larger groups of eight individuals are also recorded in the trees but they are too rare. The group is basically a family unit. Each family shares the food as well as the den. 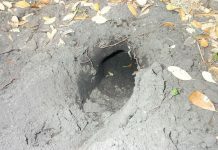 Herbert river ringtail possums live alone and adults do not share dens. Scientists have observed very rare sightings of two to three male possums gathering around a single female but that isn’t a group at all. These temporary gatherings are seen in January, June, and October. 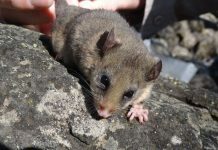 Common ringtail possums are mainly found in southern Australia. They are not known to form permanent groups. Nonetheless, ringtail possums are sociable creatures. Many a times, individuals overlap their home ranges so much so that sometimes individuals use the same nesting sites. As many as eight individuals can be found in a single group but the group doesn’t appear to last too long.